Click the above image to learn more about the creator of this web site. To View My Other Herbie Pages Just Click On The Links Below! Herbie Days At Disney 2000 Car Show! Thank You For letting us be a part of your family for over two decades! 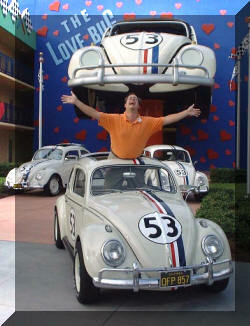 Welcome to the original Herbie The LOVE BUG web site! Herbie Mania was the first site on the web that was (and still is) exclusively devoted to Herbie! 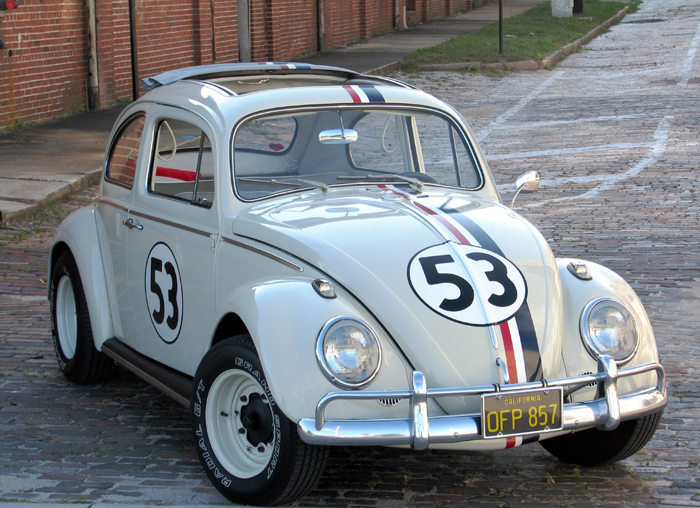 It is the home for the Herbie The Love Bug Fan Club and Historical Society. 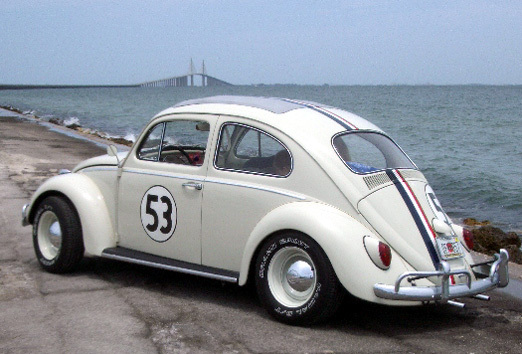 If you are a Disney fan, a VW enthusiast, or a Herbie lover you are sure to have a great time exploring all of the Herbie web pages and photo sites. This web site contains tons of information and includes virtually anything and everything you have ever wanted to know about The Love Bug. Think of this site as a window to your past. Just grab a comfy chair, kick back, relax, and enjoy the ride! it's HERBIE MANIA! If you are not sure where to begin you might want to take advantage of any of the Herbie links located along the left side of this page. Herbie's now on FACEBOOK too! Our Herbie community stays really active with thousands of members posting photos, stories, news, and more. Click HERE to visit Herbie's FACEBOOK page. Herbiemania is a safe place for the ENTIRE family. That's my promise to you. If you find any links that are inappropriate please bring them to my attention immediately. Just click on Herbie's mail box. Sadly, our friend Dean Jones passed away from Parkinson's disease on September 1, 2015. He was 84. Dean was more than just an actor who played along side Herbie. Dean was a godly man with a heart for loving and helping people. Thankfully, Dean leaves behind a great legacy that will impact generations to come. I have a personal connection with Dean because he had a hand in personally changing my life. How so? Just click HERE to read how Dean Jones impacted my life. Back in 1998 I had the opportunity to interview Dean Jones. 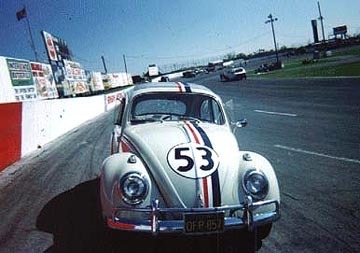 At the time, the Herbie scene was very new and there was little available information out there. 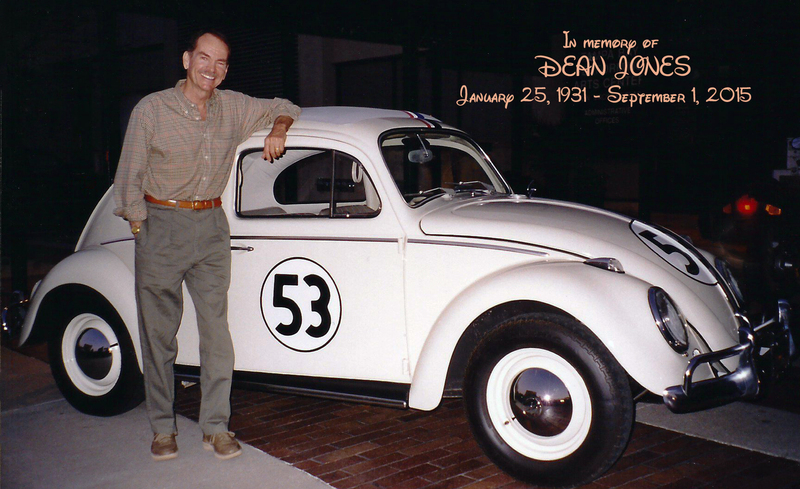 Dean was a true gentleman and provided me with some excellent behind the scenes stories from the Herbie films. I'm so blessed that I had the opportunity to meet him. If you've seen the 2-disc Love Bug special edition DVD the bonus features contain interviews with the cast including Dean Jones. In his interview, Dean shared some of what her shared with me during our interview. To read the transcript of the interview just click on the image located to the left. So, When Is Herbie's Birthday?! In 2013 I wrote to Volkswagen to find out the official build date (birthday) for my Herbie. 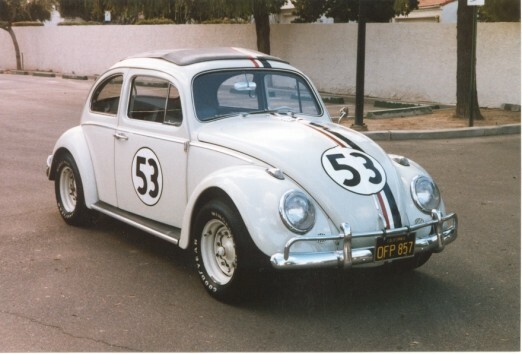 What I found was that Herbie was created on May 24th, 1963! So, to celebrate Herbie's 50th "birthday" we threw him a party, complete with a cake, balloons, and huge party hat! Herbie celebrated in style! On the track at Sunshine Speedway in 1997 The day I picked Herbie up! This is what my car looked like when I first drove her home in December of 1994. Herbie was just a "sad little bucket of bolts." 2017 marks the 20th anniversary for this web site! I find it so hard to believe that two decades have gone by. Much has happened over the years. The photos displayed above are some of the very first ones that I posted on my site back in 1997. The picture on the top right is how my Herbie looked on the day that I brought him home back in December 1994. 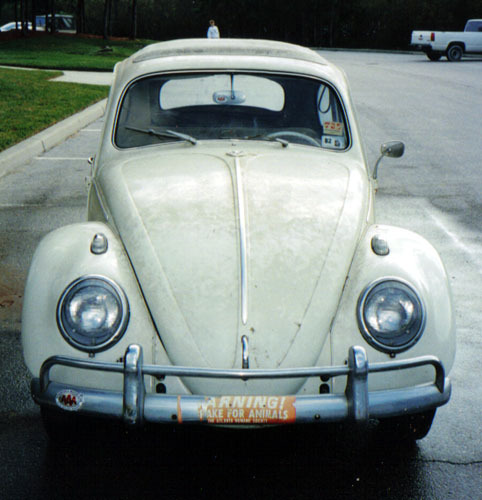 It's hard to believe that my Herbie's restoration was completed in April of 1997! WOW, does the time fly! Seems like only yesterday, but this web site was originally created on 12/15/1997. A crash due to a virus wiped me out a year later but I was back up and running with a new computer. Back then I just called my page " The Herbie the Love Bug Fan club." This site originally began on America Online in 1997. In 2005 I decided to purchase an official dot com name and moved the site off of America Online. This is when the official HERBIEMANIA went live! Dropping my AOL site meant that the search ranking would have to start all over again, but over the years Herbiemania.com has remained on the first page of the the best search engines. Not bad for a web page that has never spent one cent advertising. This just proves that word of mouth is a wonderful thing! Herbiemania has always been a one man labor of love. However, I would like to thank all of you out there who helped me to share my passion. While Herbiemania.com isn't as technically advanced as I'd like it to be, it has come a long way from a simple one page site devoted to preserving Herbie's memory. Just like Herbie, this site has rememained a "classic." You won't find anything flashy here (yet). We are still old school html. There's nothing wrong with simplicity, right? If you think about it, isn't Herbie simple too? I am hoping to find a fan who would like to recharge this site and bring it into the 21st century. If you are a budding web designer and would like to volunteer your services, please drop me a line. Be sure to check the "How To Build A Herbie" link on the left side of the page. If you are building a Herbie for yourself, that page contains a great wealth of information that will make your job easier. My Herbie's Appearance in "Herbie Fully Loaded." It's a small cameo but if you freeze your DVD you can see my Herbie on the screen (see picture above) right after Tripp races Herbie for the first time. This picture was captured from the scene where the TV sportscasters are discussing how Tripp was beaten by a VW. 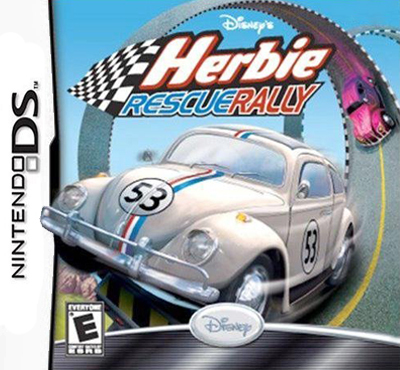 If you are a Nintendo DS fan, check out the "Herbie Rescue Rally " game. 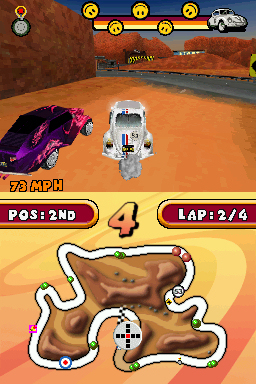 This is the second game in the Herbie series. Look in the upper right corner of the game image below. Yep, it's my Herbie! 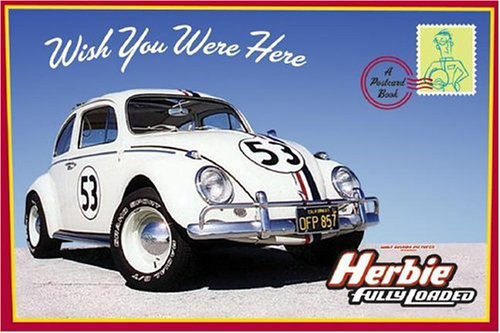 My Herbie was also used during the promotion for the "Wish You Were Here" "Herbie Fully Loaded" post card book before it was released. I captured this image off of Amazon.com before the movie premiered. Unfortunately, the image of my car was removed before the book went to press. 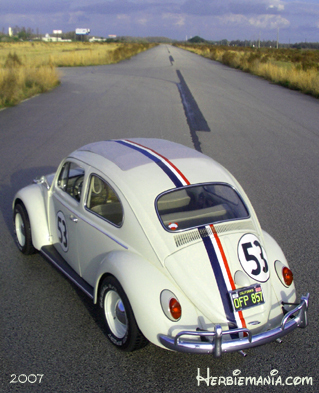 This image of my car is probably the most used image of Herbie on the internet. I had it as the main image for my website for a few years and it appears as though many people have saved it to use for themselves. Check ebay and you'll probably still find people making and selling items with this picture on it. Don't get too excited yet. We aren't talking Disney here. What you are viewing above is a sample of the newest section for my web site! To ring in the New Year I've added A Herbie Home Movie section! What this section includes are links to mini Herbie movies made by me and by other Herbie fans around the world. Some of my videos will include coverage for Herbie Club events as well as just fun mini Herbie movies. It's an exciting new way to keep Herbie's memory alive and well. Keep a close eye because these movies include various Disney stars, fans, and of course many Herbies as well! Be sure to check them out! Remember, what you see above is just a sample! If you'd like me to feature your video on this site just drop me an e-mail. Just click Here. All I ask is that you remember to keep your video clean for the entire family. Just click Herbie Home Movies to be taken to the new movie page!. OK, on to the videos above! The first one was taken by me during the Herbiedays 2000 event! The video is really special because it marked the first time in twenty years that Joaquin Garay III (little "Paco" from "Herbie Goes Bananas") reunited with Herbie! The second video is of The Herbie fan Club web site's 10th Anniversary Herbie cruise. As you can see, it was a lot of fun. We hope to plan more events in the future. You can find links in the main body of the page and along the left side of the page. The ones you see on the top of my page are the most visited links. There are multiple pages so please check them out. You may also see links for toys and other related items. My goal it to make this site as comprehensive and as organized as possible. Since I am adding so many new pages it may take a while until I can fill all of them. So, you may click on a link that takes you to a page with little or no info. Have no fear, I will get to it! Your patience will be appreciated during these changes. I wanted to share a truly magical experience with you. 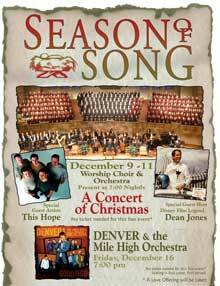 Back in December of 2005, my best friend informed me that Dean Jones was coming to his church for a Christmas show. Those of you who know me would understand my excitement. No, not because Dean is a Herbie movie star, but because of the Christian connection I have with Dean and his wife (Please see the "Never Alone" link on the top left of my page). To be brief, it was my reading of Dean and Lori's miracles and salvation in the book "Under Running Laughter" that helped me to find Jesus Christ. So in a way, the Love Bug drove me to salvation! It's funny how the Lord makes his own plans for us. Anyway, thanks in part to Dean and Lori's words I had become a Christian. I was excited to think that I might be able to meet with them again (see my Dean Jones interview from 1998 elsewhere on the site) and share my testimony. That prayer came true! On the first practice night of the show I had the chance to tell Dean and Lori just how much they did for me. I even got hugs filled with the love of God. They are two amazing people! I felt like I was on a cloud. Dean was even nice enough to write a scripture into my copy of his book. The circle was now complete. I finally had the opportunity to tell the people responsible for my new life what they had done. I know God brought us all there for a reason. Over the next few days I attended each of the nightly Christmas presentations. However, Saturday night was the most special. 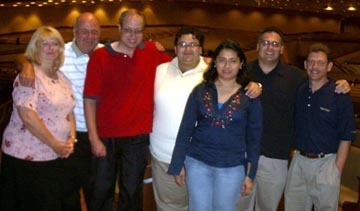 A group of good friends were in attendance with me. Dean Jones was especially moving that night. Christians can attest to what I am about to say. Sometimes you can just feel God's presence and love in the Church. That night, I felt it. I was overcome with the kind of peace and joy that cannot be comprehended. For a few moments, I felt no aches, no pains, no worries, and no fear. I was filled with joy and had complete peace! It's an indescribable feeling! I felt honored to be in the presence of The Lord, and was blessed that he had given me the opportunity to share this night with so many of my close friends. I was moved to tears, and the impact of the night was such that I will never forget it. On a side note, I also had the opportunity to share my testimony with many of the Church visitors. I didn't speak at the church, but my Herbie was on display in the lobby with a large copy of my testimony posted nearby for all to see. I prayed to God to let my story touch people's hearts. I wish all of you could have been there! The most recent Herbie adventure, "Herbie Fully Loaded," arrived in theaters on June 24th 2005! 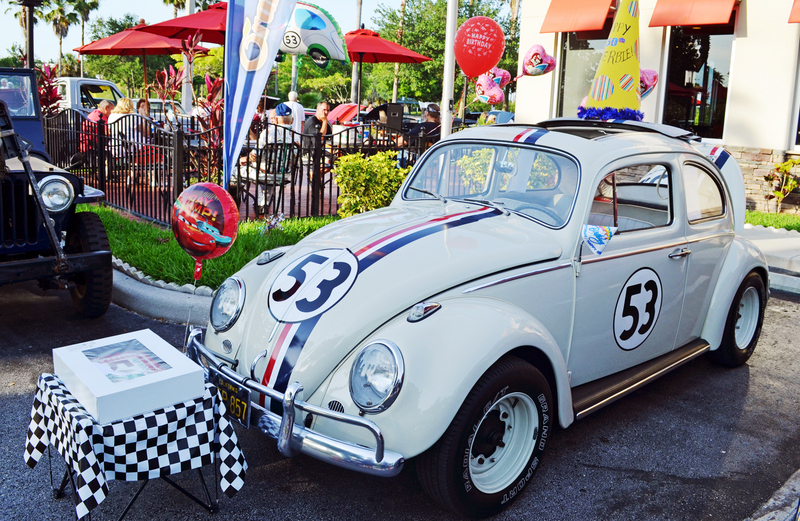 Our Herbie even got to premier the movie locally! To visit the official Disney site for HERBIE FULLY LOADED please click the poster below. Make sure you click on the link below to head on over to the OFFICIAL Disney site for Herbie Fully Loaded. They've added a lot more, including games and various downloads. The site also features OFFICIAL movie trailers for the film. Don't miss it! And for the real enthusiasts you can also check out a 2-minute "sizzle reel" for Herbie: Fully Loaded, providing a behind the scenes first glimpse at our beloved Bug. Click here to go to the OFFICIAL DISNEY MOVIE SITE. Herbie's Movies on DVD & VHS! All FIVE of Herbie's big screen adventures are available on DVD! In addition, many people write to me asking about the movie with the "Evil" black Herbie. That film is also named "The Love Bug" but was a made for TV movie which aired in 1997. The "Love Bug 1997" film is only available on VHS from used video retailers. Disney never released it on DVD. But just like the short lived Herbie televison series from the 80's, this movie can be seen on YouTube. 1. The Love Bug. Herbie's first movie! A must see! It comes as either a 2-disc special edition that covers Herbie history and more or a plain single disc. If you opt to order the two disc edition you can even see interviews with me and other Herbie fans on the bonus disc. 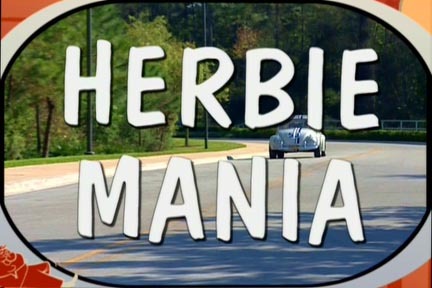 Be sure to watch the Herbie Mania section. 2. Herbie Rides Again. A single disc film with no bonus features. 3. Herbie Goes To Monte Carlo. A single disc film with no bonus features. 4. Herbie Goes Bananas. A single disc film with no bonus features. 5. Herbie Fully Loaded is also a single disc but does offer some behind the scenes featurettes. All of the original four films are available individually or as a boxed set! The first four films are also available on Blu-ray through the Disney movie club membership. 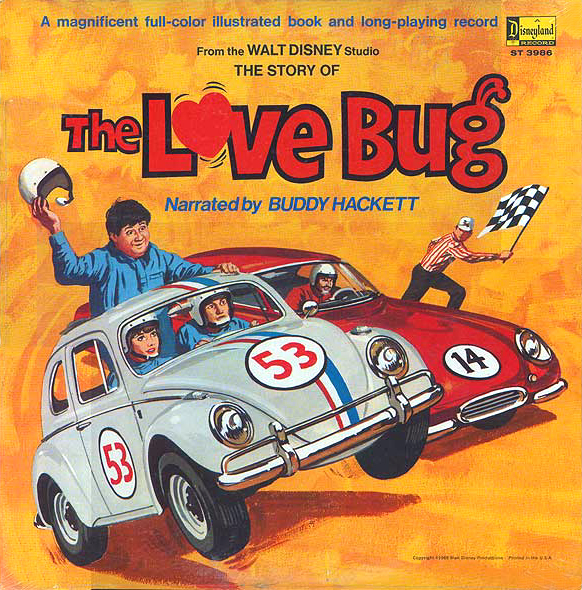 The original 1969 film, "The Love Bug" was originally released on DVD in a special edition 2 disc set on May 20th, 2003. If you are a Herbie fan this is the movie to own! 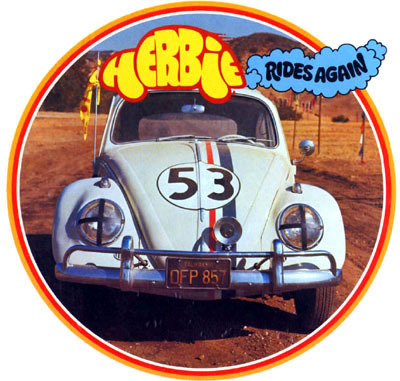 Nearly everything you ever wanted to know about Herbie is included in this two disc set! What's even more exciting is that I actually had the chance to be a part of this DVD! For more details please click on the image above. All of Herbie's feature films are available on DVD except for the 1997 TV remake. If you are a casual Herbie fan you might not even recall that Disney had a VERY short run Herbie TV series. 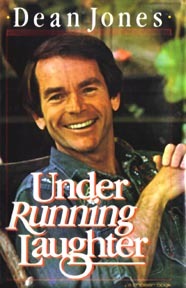 The show revolved around Jim Douglas (played by Dean Jones) and his driving school. The episodes followed Jim as he fell in love and eventually married a woman with three children. There are some pretty interesting scenes with Herbie so it's worth a look. Dean Jones evensand the show's theme song! Unfortunately, Disney has never released the Herbie TV series on video or DVD. We can only hope they will in the future. Please send them a note and tell them you want it! But until then, you can check out YouTube to view these episodes! Here's a link to a website that has detailed information about each episode. Click here to view information about the Herbie TV series. Find your favorite Herbie movie scenes! Richard, A fellow Herbie fan, has put together some great screen capture pages from each film. If you'd like to view the pictures from each of Herbie's movies, just click on the movie title graphics located above! 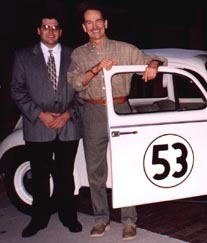 Thank you again for taking the time to explore the Herbie The Love Bug Fan Club and Historical Society! These web pages are a personal tribute to a very special VW that helped to shape my life. I remember falling in love with the LOVE BUG at an early age. This magical VW captured my heart and planted the seed to a dream. That dream was to one day become the owner of my very own Herbie! In pursuit of this dream I made a lot of new friends over the years. And more importantly, I entered into a life changing relationship with Jesus Christ! God used my love for Volkswagens to draw me close to Him. I like to tell people that the LOVE BUG drove me to salvation! This '63 ragtop is just like the original Herbie. 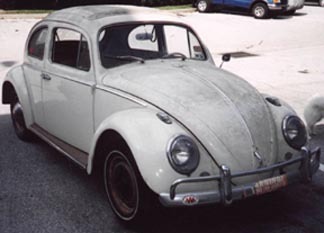 I purchased Herbie from the original owner (Mary Scott) in December of 1994. Some VW fans may call me crazy but I actually sold my '56 European sunroof Beetle in order to complete Herbie's restoration. 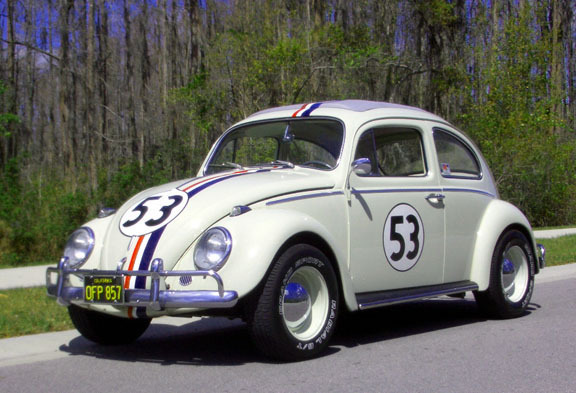 Many hours were spent making sure that Herbie was Disney accurate! All of the decals are exact reproductions of original Disney Herbie decals! Check out the front license plate too, it's Herbie's number! Special thanks goes out to the true pioneer, Bob Hoag for researching Disney's archives to create the original set of Herbie graphics. 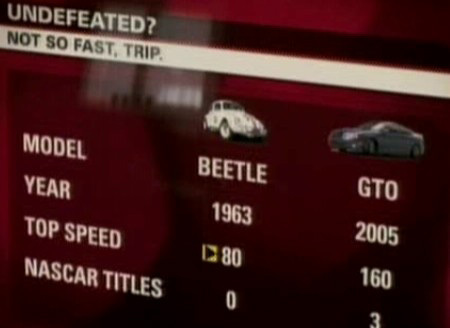 Bob paved the way for all future Herbie replicas and restorations. This is a picture of Bob's Herbie named "George." George actually rides on a set of original Herbie wheels which came off of a "Bananas" movie car. I also want to thank Daryl Adams. Daryl originally re-created the door and decklid 53 decals from original Disney movie cars that he once owned. He also reproduced Herbie's original license plate. Thanks to Daryl I had my decals and tag ready when I bought my Herbie in 1994! Say a word of thanks to Bob and Daryl. They both helped launch the Herbie hobby. I'd like to thank all of the family and friends (You know who you are) that have helped me with Herbie and my Herbie web site over the years. THANK YOU! You're a Herbie fan, right? So where do you stay when you vacation at Walt Disney World in Orlando, Florida? Why it's the All Star Movies Resort featuring The Love Bug! Herbie has an entire hotel devoted just to him! To learn more about a cool place that will really turn your wrenches, just click the button on the left to be taken to my Herbie The LOVE BUG Resort Page! 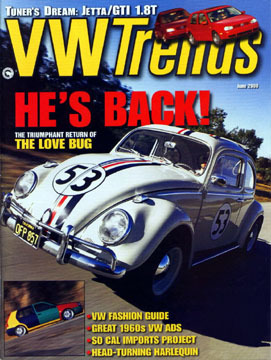 The picture on the right is the cover of the June, 2000 VW Trends magazine. That's my Herbie, oh yeah, and me driving! The magazine contains an essential Herbie history guide that I wrote specifically for the issue! It is a must have for any Herbie fan. The story is filled with detailed photos of my Herbie, original Disney cars, and Herbie collectibles. On a side note, most of the research and information written in this article was later used in the new Disney, LOVE BUG special edition DVD bonus features. The exciting part is that since this article was written even more information about Herbie has been uncovered! Unfortunately, this issue of VW TRENDS magazine is no longer available so you might have to do the E-bay thing to find a copy. However, if you can't find the issue or just want to read the article online you can click on the VW Trends image to view scans of the entire story! The face of American history was forever changed with the horrific events of September 11, 2001. From this day forward Americans began a new fight for Liberty and Freedom. Now is the time forget all of our differences and band together as one people, Americans. All of us can play an important part in this effort to end terrorism here and abroad. Together, we must serve our country and protect every freedom that we cherish and often take for granted. Raise your flag and display it proudly. Support our President and our military. Pray that God will direct all of our leaders with his divine inspiration so that one day our country can once again live without fear. Let it be said that my deepest prayers go out to the family and loved ones of those who were lost.